The state of Indiana imposed laws that require all motor vehicle passengers to wear a seat belt or be placed in a restraining device when the vehicle is in motion.Violations of these laws can result in fines of $25 for occupants 16 and older. Indiana is also one of many states running the Click It or Ticket program, an annual 5-week crackdown on improper seat belt use. Seat belts save lives. While seat belt use has been increasing and averages 88 percent nationally, there are still groups less likely to wear seat belts: teens, commercial drivers, males in rural areas, pick-up truck drivers, people driving at night, and people who have been drinking. Resources here include data, effective prevention, and links to national and state organizations working on this issue. Forty-two percent of passenger vehicle occupants killed in 2007 were unbelted. A 2009 NHTSA study estimates more than 1,600 lives could be saved and 22,000 injuries prevented if seat belt use was 90 percent in every state. The good news is, in 2009, seat belt use averaged 88 percent nationally, compared with 69 percent in 1998. NHTSA attributes this increase to the “Click It or Ticket” campaign, originally created by the National Safety Council as part of its Air Bag & Seat Belt Safety Campaign. The Indiana seat belt laws are different for children under 7-years-old. All passengers under 7 years of age must be in a child safety restraint appropriate for their age, height, and weight. Infants must be in an infant child safety seat, while toddlers and young children may be either in a booster seat or an adult seat belt adapter. Use of an adult safety belt is required for children ages 8 and up. Children under the age of 16 cannot personally be held liable for not being properly restrained. The driver of the vehicle may be charged in some cases if their under 16 passenger is not properly restrained. Children age 12 and younger are also required to be seated in the back of the vehicle rather than the front seat. Indiana also has the Indiana Buckle Up Bug program to help promote child safety restraint use. The program teaches children in grades K-3 about seat belt safety when in an Indianapolis car accident and helps encourage them to “bug” their family to follow Indiana seat belt laws as well. Infants under 20 lbs., up to 1 year old – infant-only, rear-facing safety seat in the back seat. Children 20-30 lbs., less than 1 year old – convertible seat, rear-facing in the back seat. Children 20-40 lbs., 1-4 years old – convertible or booster seat, forward-facing in the back seat. Children under 4’9″ tall, 4-8 years – belt-positioning seat belt harness or high-back belt-positioning booster seat, seated in the back seat. Before purchasing any type of child safety restraint check the product information for age, height and weight restrictions and recommendations. 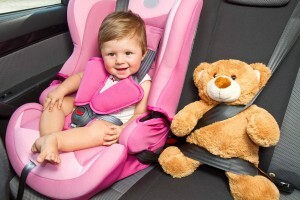 By using child safety restraints that are weight and height appropriate you can minimize the chances of serious injury in an Indianapolis car accident.